People in Amritsar shivered under intense cold wave conditions for the second day on Wednesday with mercury dipping further to 1.7° C, two degrees below normal, as the cold wave continued to sweep northwest region in the third week. The maximum temperature on Wednesday was 21.8°C (71.2°F) and the minimum 06.6°C (43.9°F). The maximum relative humidity was 88 per cent and the minimum 31 per cent. OUTLOOK FOR THURSDAY: Mainly cloudy sky. With no let-up in the unprecedented prolonged dry spell, the day temperature in the plains rose to near normal while the minimum was two to three degrees below normal. Most of the region was saved from dense fogs for the third day today. The smog that had appeared in the early hours disappeared as the day advanced and the sun shone brightly. Train services in the region plied normally. The weathermen here have forecast mainly dry weather over the next two to three days. Ludhiana and Patiala were the other colder places in Punjab as the minimum temperatures stayed two and three degrees below normal at 3.1° C and 5°C, respectively. Chandigarh and Ambala recorded the minimum temperature at near normal at 6.6° C, while Hisar was colder at 4.8° C in the morning. The day temperature in the union territory and skirting urban estates of Panchkula and SAS Nagar hovered around 22° C.
The Ladakh region, including forward areas of Jammu and Kashmir, and adjoining tribal belt of Himachal Pradesh braved 10° to 35° C, below freezing points temperatures. Shimla, the Queen of hills, continued to experience high temperature with the maximum hovering around 14.53° C and the minimum rising to 5.7° C, four degrees above normal. Una, Bhunter and Sunder Nagar stations in the state reeled in the lows of 00.00, 00.2° and 0.8° C respectively. Temperatures: Past 24 hours change: Minimum temperatures changed a little. Departures: They were below normal in Punjab and west Uttar Pradesh and normal in the rest of the region. The lowest temperature in the plains was 1°C recorded at Adampur (Punjab). Forecast valid until the morning of January 11, 2002: Rain or snow is likely at isolated places in Jammu and Kashmir. Weather will be dry in the rest of the region. 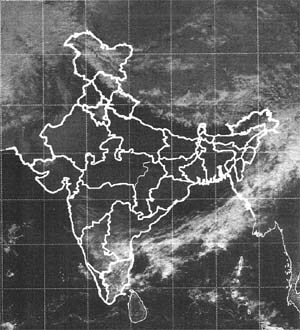 Forecast for Delhi and neighbourhood valid until the morning of January 11, 2002: Mainly clear sky. Fog in the morning. No significant change in minimum temperature. Farmers weather bulletin for Delhi forecast valid until the morning of January 11, 2002: Sky will be mainly clear.